I am forever trying to get a backlog of reviews cleared, this one I have to admit I've struggled with, not the whisky but just finding which way to broach the uniqueness of it. Ok so for whisky cognoscenti and most informed consumers, you know all about Four Roses and it's 5 yeast strains and 2 mashbills, allowing for up to 10 different variations to be made in one facility. It's a geeks delight, one that I know annoys some as they probably have a friend who won't shut up about the whole thing. What's interesting to me is that this mostly came about under the Seagram's ownership of the facility. This is a pattern we would see repeated with many of the company's other distilleries, it really was a brilliant move, remember at the time Seagrams was pumping out all kinds of blends and moving facilities to this type of arrangement would not only allow for greater consistency but would make them less reliant on sourced components for their blends. This scheme is repeated famously at Crown Royal but also what made Benriach such a stellar purchase for Billie Walker & co, since they had all kinds of style of single malt whisky in inventory. As it is this yeast driven scheme is one that is sadly still underused in distilling today, it's the one area along with terroir (that is barley types & provenance) that I believe could help usher positive change in the industry. Ok enough blab, The Four Roses Single Barrel is always composed of the same recipe (OBSV) so it's from the higher rye mashbill with their fruity yeast strain and it is bottled at 50% abv. mine is from warehouse US barrel#76-3A. Nose: Minty, rye spices, cloves, slight vegetal notes. There's sweetness but it's not big bombastic but more like Turkish delight, corn porridge, clean oak,a little apple and apricots... Its not a big thick chewy toffee vanilla bomb. There is a touch of something acetic, a little vinegary but it works in this context but could trigger you into acetone territory if you're sensitive to this. Palate: Caramel, Honey that you licked off a Popsicle stick, cinnamon and cloves. The carpentry is in check not too forward but definitely present. There is a feeling of beeswax or coconut oil? Floral, candied angelica and celery leaves, a hint of fennel. There is a touch of something acetic, a little vinegary but it works in this context but could trigger you into acetone territory if sensitive. Finish: Creamed honey, a bit of cucumber, vanilla, apricots, plum frangipane tart. I feel like this is really in a category of it's own, it's still clearly bourbon and has those familiar touchstones. Yet the nose with it's almost sharp acetic edge and the palate with those vegetal, creamy touches make it an outlier, it's a fun whisky to dissect. I can see the Four Roses style as being very polarizing, those who dig it will be amply rewarding, it's next level bourbon in the best sense. It's also fantastic value about 50$ at the LCBO. @cricklewood, thanks for your review. Those 5 different bourbons made from 5 different yeasts allows the wonderful possibility of demonstrating just how huge the influence of the yeast selection is. Of course to do so you would have had to have acquired samples of the different individual bourbons, which requires specialty shop access to private barrels (e.g. Binny's). My sister has at least 3 different single barrel bottles of different Four Roses bourbons with the same mashbill. The bourbons are very different from one another when using different yeasts. It is a wonderful and very educational exercise to do this sort of tasting. Thanks for the review @cricklewood . I quite liked the small batch and have thought about picking this one up as well. I guess with it being a SB release one can never really tell until they pop it . . . Bottle opened about a month and is 2/3 full. I'll be comparing this to my other bottle, which I have a review of on my profile. Nose: Honeydew, cantaloupe and winter melon. Wet charcoal after a campfire. Brown sugar glazed bacon. Salty. Lots of melon. Palate: Vanilla custard, and more melon. The melon really stands out. Honeydew and cantaloupe. Grassy. Strength of flavours is lacking compared to the other bottle. I wish there was more saltiness on the palate like the nose led me to believe. Finish: Medium length with Melon and vanilla. Overall: I think I enjoyed the other bottle a tad more. It had more variety and stronger flavors. This is so totally different. A similar characteristic is that you dont feel the 50% abv. This goes down very easily. Melon steals the show here. It is very enjoyable. Melons are a new sensation in whiskey for me and a nice one. The colour is a dark caramel. On the nose - pow! The wood smoke, spice and apple skins really hit you on this one; this time, there is more of a floral note than I got on the other two SBs. The herbs are more restrained here. Cinnamon and cloves. Slight hint of cotton candy. Water softens things up a bit. More subtlety than the OBSK I just wrote about, but not as delicate as the standard OBSV. On the palate those baking spices are prevalent, with more oak but less fruit. A fair amount of wood smoke. Softer caramels and vanillas. A bit tannic with water. Definitely less fruit than the other two Single Barrels we've tried today - it's amazing what a difference yeast makes! The very long finish is a river of soft savoury spices, toasted oak, mint and sage. Not as delicate as the standard expression, but more complex than the OBSK, this is pretty fantastic stuff. More subtle weaving between the spices and oak, but strangely I don't get any real "floral essences" as the yeast strain suggest. Look for it if you make it to Georgetown in the near future. Great set of reviews, I enjoyed how you highlighting the differences you perceived between recipes. I always enjoy these Four Roses shootouts. When @Nozinan and I spoke with Don Livermore at SOT, he seemed to think that yeast selection was the one aspect of whisky production that was neglected and would offer the most potential for experimentation and change. Sadly he said that this was something his successor would have to tackle. @cricklewood Interesting - I wonder why he feels he cannot tackle it? This sample came to me from @jasonhambrey. The OBSK recipe is the same high-rye mashbill as the usual Single Barrel, but with the "slight spice" yeast strain. It matured in Barrel No. 37-1M in Warehouse DN for 11 years and 3 months. The colour is a dark caramel. On the nose we have really big cigar box with tons of wood smoke, chili powder, sticky toffee pudding and crushed mint. Chocolate. Liquorice nibs. Cherry pie filling. A nice blast of bourbon spices and powerful oak. Water brings out pine and leafy earth. Alluring. On the palate the spices take a back seat to massive fruit: apple skins, cherries, raspberries and a touch of papaya. Furniture polish. More wood smoke. Something metallic, but not unpleasant. Fruitier and spicier with water. Delicious. The long finish brings out more tobacco with spice and anise. More power than the standard FR SB I just reviewed, but still fascinating with strength and complexity. I don't know the provenance of this sample but if you can find it based on the barrel information, look forward to a robust and invigorating dram. Now that we are in a trade war with the US, bourbon is on my mind (since I'm concerned we'll have to start paying more for it soon!) Also, having just visited the Four Roses distillery and warehouses a few weeks ago, I thought I'd explore a few single barrels, of different ABVs and yeast strains, and see how they compare. This particular one is a standard bottling at 50%, from Barrel No. 38-2L, from Warehouse NS. I don't know the age, but it adheres to the standard FR SB recipe of OBSV (60% corn, 35% rye, 5% malted barley, from their "delicate fruit" yeast strain). The colour is a soft caramel. On the nose we get cigar box, light vanilla, wood smoke, red apple skins and toffee. Herbal with mint and sage. Very light milk chocolate. Sour cherry. Cayenne. A bit of wood smoke, but not too much. Water brings out balsamic, with even more mint. This seems more delicate and softer than other single barrel bourbons, but no less complex. On the palate the tobacco/cigar note remains prevalent, with thicker toffee, with more spice and mint. Lots of cherry, raspberry and kumquat. Water improves the complexity with greater oak and some fennel. The spice is a bit more dominant than it should be but this still shows off what Four Roses is capable of, even in its standard expressions. The finish is long with wood smoke, dark cherry and plum. 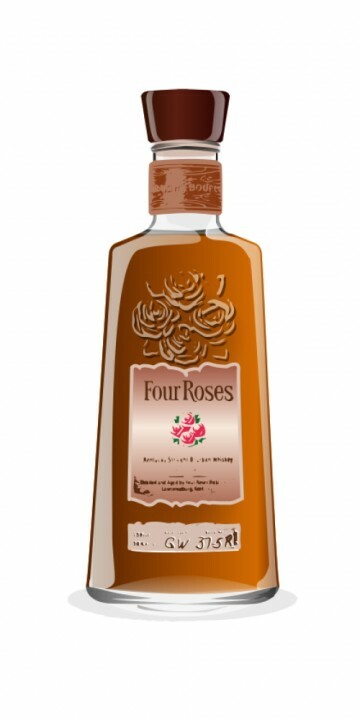 This seems to me to be one of the better Four Roses SBs I've had - massive complexity, subtlety and panache. If you see this particular barrel (purchased at an LCBO), snap it up. Tonight I use my new(ish) Kentucky Bourbon Glass (KBG) to taste bourbon for the first time. I searched through my open bourbon bottles for a non-Booker’s (i.e. : something a little less intense) that I haven’t reviewed yet, and came across this one. It will be interesting how this single barrel compares to the one @OdysseusUnbound reviewed (possible but unlikely the same batch as we’re both in Ontario). This bottle was opened in March 2016, has been opened numerous times (gassed each time), and was just under half full. This expression is reviewed in my usual manner, covering and allowing it to settle after which I take my nosing and tasting notes. No water in this 50% ABV bourbon. Interestingly (or not, I will let you decide), I give this one to the KBG. I think it’s the most balanced of the three glasses. I look forward to seeing how this plays out for some of my barrel proof bourbons. Well, since you asked (good question), in no particular order, Booker's (esp. 2015-01), George T Stagg, Old Grand-dad 114 and BIB, Stagg Jr, ECBP. I freely admit I've not tasted as widely as some others have. Nice review. Our scores are similar. I wonder if we got the same batch...I haven't updated my review with the relevant information yet. I'm thinking it might be a different batch since my nose and palate definitely detected some menthol/herbal notes. Then again, our tastes are different so perhaps what stands out to your palate is different than what I notice. Out of curiosity, what are some of your favourite bourbons? This comes from Warehouse KE and Barrel No. 6-5D. For those who care about the mashbill / yeast strain, the standard Four Roses Single Barrel code is OBSV (the Four Roses website will decipher this for you). The colour is a medium coppery gold. On the nose we have rich cherries, cigar tobacco, polished oak, dark caramel, vanilla and menthol. Cocoa powder. Some savoury herbs in the background. Freshly sawn lumber. Maltier, spicier notes emerge with water. Strong, woody but balanced and elegant. On the palate there are more cherries, but with blackberries as well. Creamy mouthfeel. Chocolate, vanilla and a lighter caramel than on the nose. The wood influence here is more prominent, pulling a bit too much in the mouth. Water adds more spice. Rich and delicious. @talexander I like your review and I like this bourbon very much. That's a solid score and where I'd put it, 88. I'm fortunate that it's readily available where I am. If it's not where you are I'd pick up as many as your budget will allow. Thanks @Benancio - there seems to be quite a bit here in Ontario for now - after it disappears it usually takes quite a while to come back though! Based on the previous discussions on Single Barrel 4R's and it's shifting profile, I decided to try it out for myself. I find myself quite surprised by this Bourbon, but not in a good way. It's one of those odd bourbons that really throw you off and makes you want to have another drink right after of something more decent and more fitting of the title "Bourbon Whiskey". Nose: Cinnamon, maple syrup, burnt toast,bread with butter, roasted nuts, and yes, the oddest of smells, chamomile. The chamomile on the nose really threw me off. It's a smell I wasn't expecting in a bourbon. Unfortunately, it reminds me too much of my grappa which is specifically made of chamomile. I don't think that bodes well for a bourbon when you smell like chamomile grappa. Palate: Medium bodied to light. Sweet arrival. Tannins, this has a good grip to it. Peppery and hot. It's a very flowery mouthful with very fresh oak to go along with it. Seriously though, is this 4R's or my Chamomile grappa? I'm having difficulty telling them apart (smelling and tasting side-by-side now). Really the only thing distinguishing this 4R's from the grappa is the higher ABV heat, besides that, almost identical in taste (grappa is more intensely sweet), and viscosity. Finish: oily and again more of the oak. That's all she wrote really. Overall, it's not very spectacular. The small batch bourbon from 4R's seems more well rounded and more consistent. This Bourbon has an odd nose that's too flowery. A palate that's to sweet. If I was to compare it to another whisky it's not a Bourbon. The palate and finish is more similar to a less sweet Marolo chamomile grappa. The closest Whisky would be a Macallan fine oak 10 or a Glenlivet 12 and even that's an insult to the aforementioned. Well that's enough for tonight. Four Roses Single Barrel can be one of 10 different whiskeys: 5 yeasts, 2 mashbills. Apples to oranges comparisons unless you know exactly which formula was used. The floral thing is from the yeast used. Without exact formula information you really don't know which whiskey is being discussed. Four Roses Single barrel bourbon can be and is a lot of different things. I've had several of these that I loved and a couple which left me indifferent. 5 of 6 of those I was sampling were from private barrels which were labeled with formula information which allowed me to know which bourbon I was drinking and that I was drinking different bourbons. @ValueWhisky Oh no doubt it's still a nice sip. But I just found the recurring flowery (chamomile) note to be overbearing. It just kept coming up in the nose and in the taste. I would personally choose the small batch 4R's just because I like the presentation better. The nose on it is more Bourbon like, lots of caramel, all spice, and yet it has that jagged edge as well to let you know it's a bourbon. Just the contrast makes it more interesting. On the palate it's the opposite. While the S.barrel starts off very flowery as well as hot and spicy, the small batch doesn't turn spicy until it's been on your tongue for a bit. The grip on the small batch happens more in the finish than on the palate. So it's finish is more satisfying to me. But yes, Single Barrel 4R's is a nice and different Bourbon. Still decent and still worth a try.